With a complimentary continental breakfast an outdoor pool and rooms with internet access and microwaves Baymont Inn & Suites Horn Lake Southaven features popular amenities just 20 minutes from the heart of Memphis. Two-story Baymont Inn & Suites offers 58 rooms with 42-inch LCD TVs mini-fridges microwaves and coffeemakers. Non-smoking rooms are available. Stay connected from the comfort of your room with available high-speed internet access. Wake up and follow the scent of fresh coffee to the hotel's complimentary continental breakfast. 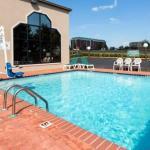 Soak up the sunshine in the outdoor pool or get pumping in the fitness room. There is a business center on-site. Parking is free. The hotel is off I-69 15 miles south of downtown Memphis. There are restaurants within a half-mile of the hotel offering everything from barbeque to burgers. Elvis enthusiasts are seven miles from Graceland. Blues fans are 20 minutes from legendary Beale Street where great music flows out of the bars and into downtown Memphis streets. Stock up on deals at Southaven Towne Center a half-mile away or Southland Mall four miles away. Shows at Snowden Grove Amphitheater are five miles away. The hotel is six miles from Memphis International Airport.